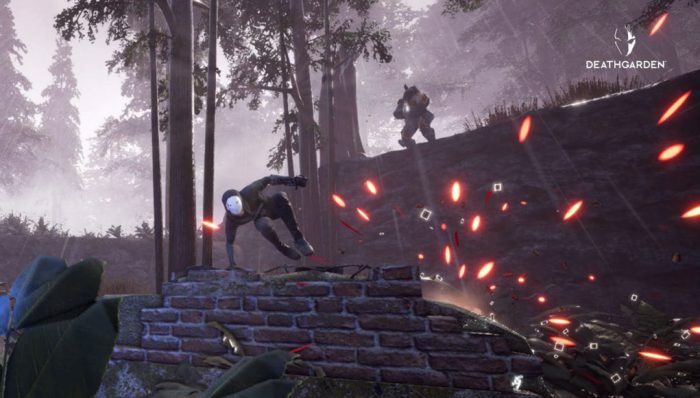 Deathgarden is the newest game from Behaviour Interactive and is the spiritual successor to Death by Daylight. 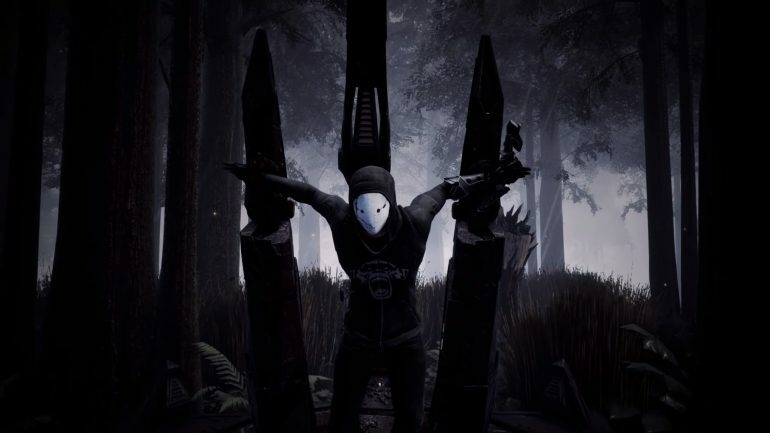 Following the same idea, Deathgarden has you assuming the role of one of five “runners” who’s goal is to try to activate 2 out of 3 totem poles to open the exits, while being actively hunted by a heavy armored “Hunter.” Once you activate a totem, your location is revealed to the Hunter who will come quickly and hard. Don’t worry though, the hunters are without ways to defend themselves. Each Runner is armed with wrist arrows to stun and knock back the Hunter. Should you be downed by the Hunter, your team can rescue you and revive you, but you will most likely be sent to the blood post to think about what you have done. Once again, your team can rescue you from the “blood post,” but the Hunter can execute you removing you from the game. Once the “Hunter” has removed 3 people from the game, the round ends. Best 2 out of 3 rounds wins. The runners are playing in third person, while the Hunter is playing in first person. This whole experience creates a really fun “cat and mouse” type gameplay that I can see being fun for a long time. Overall, although in early alpha, the game ran super smooth and without many hiccups. The Hunter did seem to be a little overpowered. Several times, I was downed and was instantly sent to the Blood Post only to have the hunter run straight over to me to execute me without my team having a chance to rescue me. When I explained this to the dev, they stated to me that the Blood Posts don’t become active until at least three people have been downed and even after a blood post is activated, there is a 15 second wait til a runner could be executed. Playing the game, it did not seem to be the case, but I also wasn’t counting the seconds or watching to see how many runners were downed before me. Which speaks well for the game and not me playing. I may have been a bad teammate, but the game was so intense that I was running for my life most of the time, enjoying myself while playing a game that normally would not have appealed to me. Deathgarden has opened my eyes to these types of games, giving me a reason to go back and try Death by Daylight. Hey everyone, Matt here. I previewed the Hunter role in Deathgarden opposite to Tricky’s experience with the runner. I’ve played quite a few asymmetrical multiplayer games but none have ever really nailed the formula. Jason was scary in Friday the 13th and the monsters in Evolve all were pretty cool but playing as the bad guy in these types of games often feels slightly limiting, underwhelming, and kind of clunky. I’ve always felt more like I was flailing and failing than some monster of total bad-assery. That is decidedly not the case in Deathgarden. I ended up playing two rounds, I won one and lost the other. The whole time I felt like I was walking imminent Death. I felt like the soldier from Doom that had been accidentally dropped into a bad teen slasher flick. They were a cabin full of kids expecting a machete wielding maniac. Unfortunately, for them, I was a shotgun duct taped to a cheetah. Though I only pulled out the win in one of my two rounds I spent most of my time smiling like an idiot. Deathgarden, if nothing else, is incredibly fun to play. Bouncing between the three capture points I’d watch the runners scurry off like mice as I’d approach. Most times I would down at least one of them. I liked that I was able to see an outline when one or more of the runners was at a particular capture point. It made it easier to track who was where. I wasn’t entirely clear on how the Blood Posts worked. I know my win condition was to kill three of the runners, but I couldn’t quite figure out how to trigger the stands when I needed too. This was probably more due to how much info I had to take in prior to playing than poor instruction. In my time with the game, even though I did feel extremely powerful, I never felt overpowered. The round I won was by the skin of my teeth and the round I lost wasn’t particularly close. I really had a blast playing Deathgarden and can’t wait for it to make it to full release. I think they’ve hit the nerve of the genre that so many have missed. The game is in early alpha with no release date. Platforms unknown at this time though we played on PC for this demo. Price point is also an unknown at this time. One thing I was assured of, however, was Behaviour Interactive will be staying far away from loot-boxes stating “We don’t want to go down the same path as EA”.